Migraines are more than just a bad headache. If you suffer from migraine symptoms regularly, they can disrupt your life and even cause disability. But a range of migraine medication out there can give you relief. Migraine headaches can be unrelenting; symptoms can include nausea, vomiting, sensitivity to light, and blurred vision. Medications, thankfully, can offer more relief than old standbys like compresses. Many migraine sufferers opt for pharmacological migraine medication. Other effective migraine medications include non-pharmacological options. 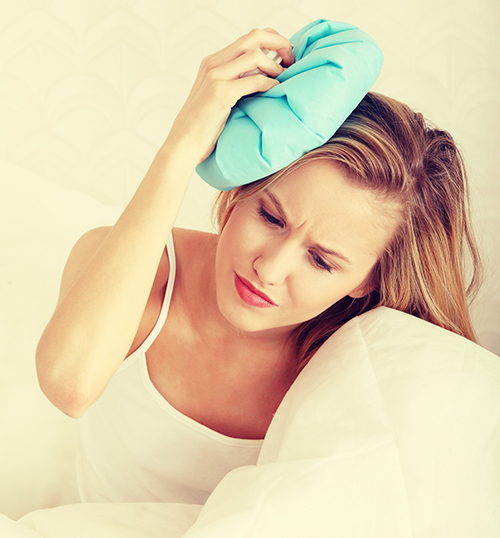 If your migraine symptoms are mild, they may respond to over-the-counter (OTC) analgesics like acetaminophen (Tylenol), or nonsteroidal anti-inflammatory drugs (NSAIDs), which include aspirin, ibuprofen (Advil, Motrin), and naproxen (Aleve, Naprosyn). Some OTC migraine medication (such as Excedrin) combine aspirin and acetaminophen with caffeine, which reduces inflammation and helps pain-relieving ingredients work faster. You also may be given anti-nausea medications. Severe and/or frequent migraine symptoms may require prescription drugs, such as triptans, which include sumatriptan (Imitrex), and zolmitriptan (Zomig); opioids, which include hydrocodone (Vicodin), and oxycodone (Percocet); and ergots, which include ergotamine (Ergomar), and dihydroergotamine (Migranal). You also may be given anti-nausea drugs, and corticosteroids such as prednisone (Deltasone)—the latter isn’t used often, but can improve the effectiveness of other migraine medication if taken in conjunction with them. Drugs that may help prevent migraines include beta-blockers like metoprolol (Lopressor) and propranolol (Inderal); calcium channel blockers like verapamil (Covera), nimodipine (Nimotop), and diltiazem (Cardizem), tricyclic antidepressants, which include amitriptyline (Elavil) and nortriptyline (Pamelor), and anti-convulsants such as topiramate (Topamax). Pain pathways during a migraine attack involve the brain’s vascular structure, neurons and inflammation. Besides trying migraine medication, consider various migraine headache home remedies. Here are 10 options. Keep a migraine diary in which you note any triggers that precede migraine symptoms. If an obvious pattern emerges, try to avoid those triggers. When migraine symptoms strike, lie down in a darkened room, preferably with a cool, damp towel, or washcloth covering your eyes and forehead. Try the Cefalu, a battery-operated, headband-like device designed to be positioned in the center of the forehead, just above the eyes. It transmits a mild electrical current through the skin to stimulate a nerve associated with migraines. Acupuncture: This form of traditional Chinese medicine involves the insertion of very fine needles into certain areas in order to clear “blockages” in the flow of energy through the body. Several studies suggest that acupuncture may help reduce the frequency of migraines. Aromatherapy: This involves inhaling “essential oils” derived from the flowers, fruit, seeds, leaves and bark of certain plants. The oils can be inhaled, or diluted in a carrier oil and applied topically. Research suggests that aromatherapy can ease headaches, but the essential oils used for aromatherapy are very concentrated and can be very potent, so always consult a qualified aromatherapist. Biofeedback: Not all non-pharmacological migraine medication can stop a migraine once it starts, but biofeedback might be able to help you avoid the stress and tension that can underlie migraine symptoms, and this could reduce their frequency. During a biofeedback session, you’re connected to electrical sensors that pick up body signals and transmit them to a special computer that displays the signals via images or sounds that indicate your stress levels, skin temperature, blood pressure, heart rate, and brain waves. Your physician then guides you in how to vary your thoughts and emotions so that you see a change in the signal display. The idea is that you learn how to consciously control your body’s responses—including its response to pain. Herbs: The herbs feverfew and butterbur can be effective migraine medication, but consult a registered herbalist about their safe use, and always tell your doctor before taking any herbal supplement. Homeopathy: Homeopathy operates from the premise that stimulating the body’s own defense mechanisms can help prevent or treat illness. In order to do this, it exposes the body to minute doses of diluted substances that—according to homeopathic theory—would produce the same or similar symptoms as whatever illness is being treated. There is much anecdotal evidence that homeopathy can help ease headaches. Massage: Studies suggest that massage is an effective treatment strategy for reducing the muscle tension and pain that can underlie headaches. Mindfulness-based stress reduction (MSBR): A form of non-religious meditation, mindfulness-based stress reduction consists of simple practices to train the mind’s attention in ways that have been shown to reduce the intensity of pain, as well as improve your physical functioning and your ability to engage with life despite pain. A recent study suggested that MSBR has beneficial effects on migraine duration and severity. anti inflammatory, anti inflammatory drugs, antidepressants, beta blockers, blood pressure, brain, caffeine, calcium, calcium channel blockers, corticosteroids, covera, feverfew, headache home remedies, headaches, herbalist, home remedies, homeopathic, inflammation, massage, meditation, migraine, migraine headache, migraine medication, migraine symptoms, migraines, mindfulness, muscle, muscle tension, nsaids, pain, severe migraine, skin, stress, stress reduction, supplement, tricyclic antidepressants, triptans.